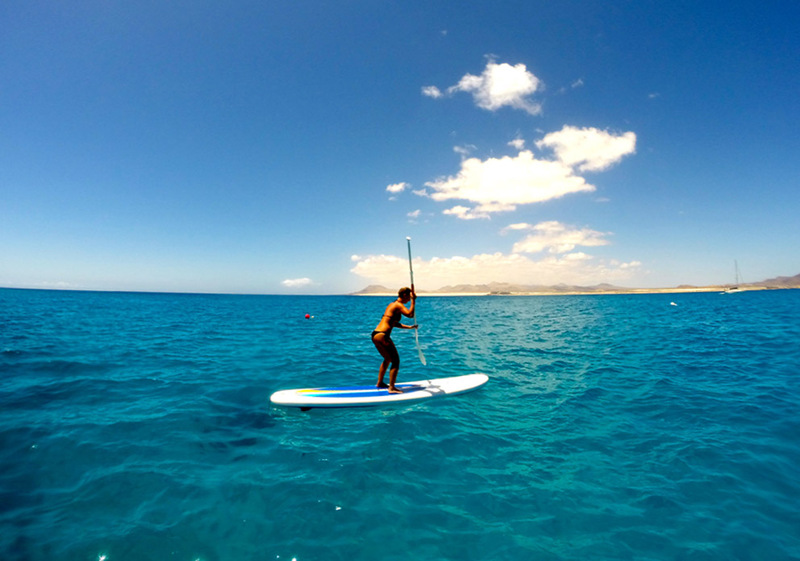 For some years Stand Up Paddle (SUP) has become a sport of great importance, having more and more followers every day. 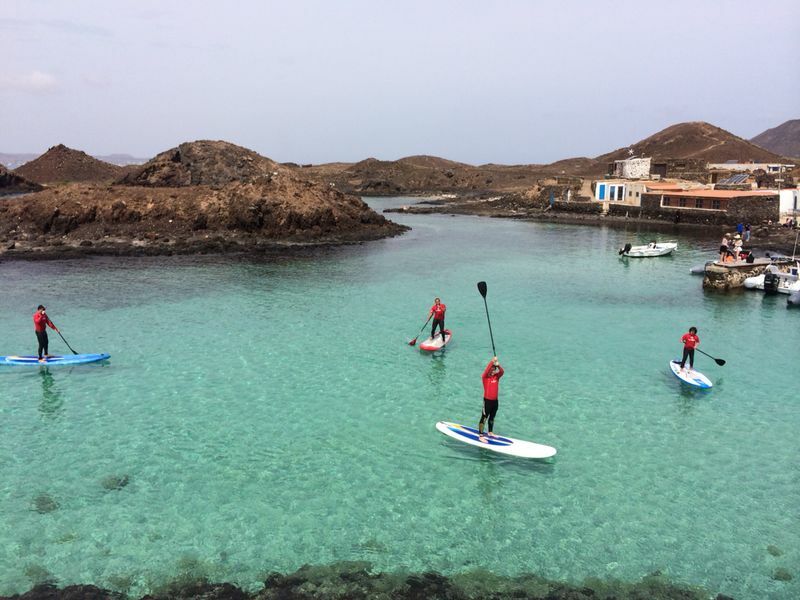 One of the attractions we offer in our Fuertecharter boat trips to the island of Lobos is making contact with this sport, as we have SUP boards, among other “toys”, to make your visit to the nearby island truly unforgettable. 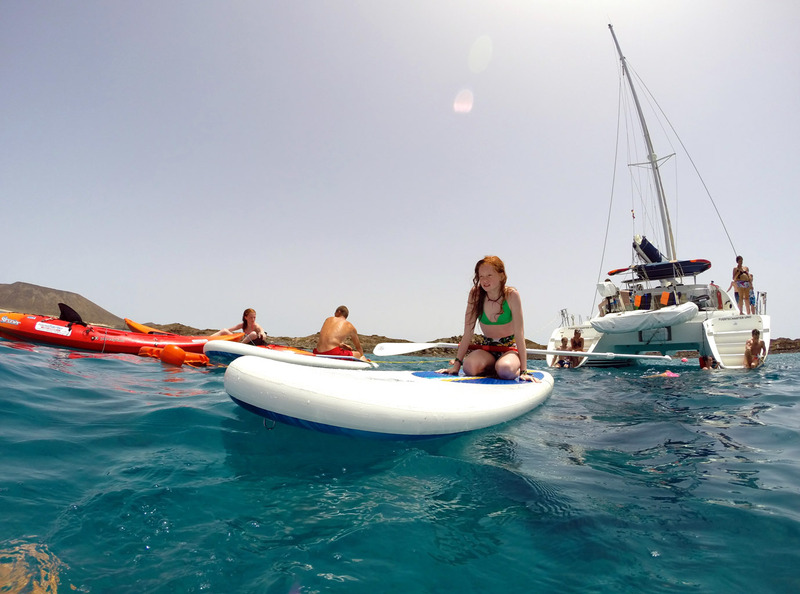 SUP is a sport whose bases are very easy to learn and it’s suitable for all ages and for family practice. Yes, it is true that, when trying to catch waves in SUP, knowledge of the environment and much more practice is required, but learning how to manage the board and paddle on flat waters is a challenge at almost everybody’s reach. The boards we have in FuerteCharter are high volume initiation boards, which makes learning faster. SUP, apart from being fun, is a very healthy sport, because it makes us get into shape without even realising. Thanks to SUP we strengthen the upper part of our body, our arms, back and abs with each oar stroke. Moreover we also excecise our legs, whose muscles are always active to keep balance on the board. Improving our balance we’ll favour the control over our own body, which will help us in our daily life and also to practise other sports. To learn, rent before buying equipment: the type of board and paddles will depend on your size, weight, constitution … so it is better to try several equipments to see which one works best for you. Protect your body from the sun and the board with a wetsuit, in case the water is cold, or with a lycra, if it’s hot. We must be careful not to have obtacles around or other people we can hurt. Keep in mind that SUP boards are very bulky and can do much harm, as well as the paddle, which we can move uncontrollably and cause an accident. To go on the SUP board we will do it from the rear part, leaning over our chest and trying to reach the middle part. Once there we will try to kneel down on the table, and in this position will perform our first paddle strokes thus trying to get used to the feeling. When we feel confident enough , we’ll try to stand on the middle of the board, bending our knees to lower the centre of gravity. With soft and slow movements we’ll begin to perform the first paddle strokes. With practice we’ll realise that the paddle is our foothold in the water. We must always grab the paddle by its handle and not by the blade, and try to never let it go in the water, not even when we fall. If once you have tried this sport you want to keep progressing we suggest resorting to professionals, such as the ones in Redshark, to advise you. Remember that SUP, in modalities such as waves, is a quite more complex sport than just practising in flat water, so if you have not mastered the equipment very well you may have problems with other athletes in the water. Most of all have fun, but be sensible too.